Late night infomercials are a great way to get visitors to a website where they can learn more or buy a product. But be careful. The audience watching these late night infomercials are largely made up of people who know little or nothing about making money online. 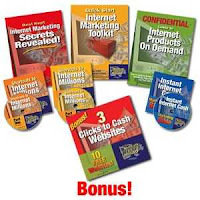 Because of this they would bite at the promise of quick and easy money this being the case of one particular latenight infomercial... Jeff Paul's Shortcuts to Internet Millions. This particular product is very deceptively promoted and the unsuspecting viewer who dreams of easy cash will usually get lured in. My word of advice is whenever you hear about a particular product do some research and make sure that you are reliably informed about it before taking out your credit card. This will not only save you from being scammed but it will save you your hard earned money.